The category of "key chain knives" has been around for a long time. In most cases, these are little pen knives, with thin blades and slip joint pocket knife frames. Gerry McGinnis had a radically innovative idea, which is why this knife is in CRKT's catalog. He calls it the Shrimp. The revolutionary idea is this: make a small knife with premium quality materials and big knife build. The Shrimp is not a toy, but a real sport and work knife. The only difference is that it has a 1.75" blade and a 2.5" handle. Take the blade, for example. It is made of premium 8Cr13MoV stainless steel in a high satin finish. Although short, it is fully featured, with a modified drop point shape with recurve. It is high hollow ground and has a slight swedge on the top edge. It is opened by a large CNC-milled nail notch. There are aggressive friction grooves on the spine for the thumb. But most impressively, the blade is a full 0.125" (3.2 mm) thick, a width common on much larger folders. The Shrimp has a frame-lock build, eliminating the need for separate liners. The right side frame is 3Cr13 stainless steel on all models. The left frame is 6061anodized aluminum on the colored models, and stainless steel on the bead-blast model 1181. The left frame is skeletonized to save weight. To aid grip, there aretwo finger choils and the frame has a rounded contour. Five color schemes are available: Black, Stainless Bead-Blast, Metallic Orange, Metallic Pink, and Metallic Purple. The combination of thick blade, solid frame lock and large blade pivot means that this is one shrimp that doesn't wiggle! But there's more to the story. 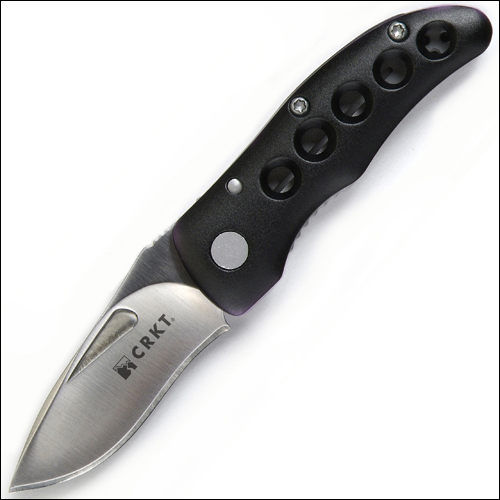 Just like CRKT's larger knives, the Shrimp has a removable stainless steel pocket clip in bead-blast finish. Torx fasteners are used throughout. There are lubrous washers at the blade pivot. And there's a small key chain loop that folds out of the frame. And finally, CRKT has added a back spacer of moonglow plastic that glows in the dark, so you can quickly find your Shrimp at night. CRKT has value-priced the Shrimp so anyone can afford one as a key chain knife, a money clip knife, a first knife, or a gift knife. And please remember, the name Shrimp is not intended as an insult, but as a term of endearment for a tough little guy. Gerry McGinnis is a student in business at North Carolina State University, who, at age 20, is the youngest knife designer to appear in the CRKT catalog. He started making knives when he was 15, learning mostly from Internet forums, and built up his equipment from hand tools to power tools. He met Alan Folts, who he says "was very generous and helped advance my knifemaking skills, particularly with folders." Gerry transitioned from mostly fixed blades to folders in about a year, and got interested in folder designs with flippers. He has concentrated on mostly flipper designs and perfecting the mechanism because of their ambidextrous one-handed opening characteristics and ease of use. Gerry placed 2nd in the 2008 Custom Knives and Guns Knifemaker Buildoff in the folder category and has been mentioned several times in Blade Magazine as a new maker to watch. Gerry is the designer of the new CRKT Tuition and Summa lines, which to the casual observer seem to be the work of a designer with decades of experience.